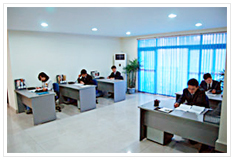 Ningbo Pacemaker Auto Parts Manufacturing Co., Ltd is specialized in semi trailer part manufacture. Ningbo Pacemaker International Trading Co., Ltd, as its sales department, is incharge of all the export and import business. It also has a manufacturing foundation in Anhui. Together, they make PCMK as the professional semi trailer supplier in China, with the most varieties of products and specifications as well as the most professional service in the semi trailer part industry. PCMK, located in Ningbo—a beautiful coastal city in East China, is close to Shanghai, boasting convenient transportation. PCMK now has more than 20000m2 standardized workshops, more than 100 sets of equipments such as 1260t four-column oil pressure machine, NC cutting machines, etc., and 62 skilled professional technicians among 250 employees. With no less than ten years of experience accumulated in semi-trailer industry of those two factories above, PCMK is professional in producing over 200 sorts of its own brand PCMK semi-trailer spare parts, such as fifth wheel series, bogie suspension series, axle series, landing gear series, and suspension series, etc. Meanwhile, the company has integrated high-quality resources of domestic semi-trailer industry, and will be sincere to provide all kinds of semi-trailer components and relative services with excellent performance & price ratio for customers both home and abroad. PCMK pays great attention to continuous innovations and quality management of products. So far PCMK owns two national patents of the fifth wheel (patent No. : ZL200420115976.5, ZL2007200010742). It has passed ISO9001 quality system certification and a scientific quality management system is being formed according to the requirements of TS16949. Terse and excellent is the manufacturing technology of our products. Each product is of high consistency and interchangeability. We organize production based on JIT and SCM principles, pursuing the perfect balance between product quality and cost. Ningbo Pacemaker Auto Parts Manufacturing Co., Ltd. ---- A High-end Platform of Semi-trailer and Semi-trailer Part Industry in the World.